As the summer has arrived and the temperatures are beginning to soar, air conditioning may seem to be more of a necessity rather than a luxury. We have all been in situations whether it’s at the workplace or at home were the fan may not be seem to be doing the trick and all you want to do is go and make the most of the gorgeous weather rather than being stuck in doors. Fortunately, air conditioning can make your day seem like a breeze whilst also keeping you cool in humid temperatures. All air conditioners basically work in a similar fashion to that of a refrigerator. 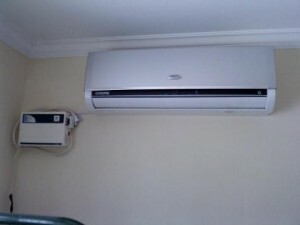 Regardless of whether it is a portable, room or central air conditioner they all virtually have the same principals. In each air conditioning unit you will find several parts which include an evaporator, a condenser, a refrigerant and a compressor. Each of these four parts play a vital role in ensuring the air conditioning unit performs adequately whilst controlling the temperature. The evaporator basically draws out the warm air from inside the room and is made from copper and the condenser usually disperses the heat. In terms of the refrigerant its main purpose is to release the heat from within the room outdoors whilst the compressor acts as a pump to pass through the refrigerant. If any of these four parts do not function correctly then the air conditioning unit will experience major problems. There seems to be a debate between many business owners as to whether you should include an air conditioning unit within the workplace. If you were to ask office workers about their opinion then most will be in agreeance that air conditioning is a must have for the office. There are many benefits of having air conditioning within the workplace. It not only helps to increase staff productivity but also helps in keeping them comfortable whilst the temperatures continue to rise. If you also have any important business meetings taking place then having a well-conditioned room is vital as you do not want to be conducting a long meeting in a hot and stuffy office. An important aspect which goes relatively unnoticed is that it could also help in reducing staff sickness days. This is because the low temperatures which air conditioning units produce help in reducing insects and parasites which may be in the building. In addition to this the low temperatures also reduce sweating which will ensure that the staff are properly hydrated. 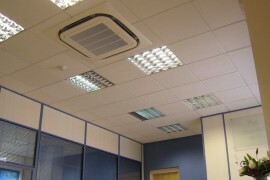 Instead of air conditioning being a luxury in the workplace it is starting to become more of a must have in the office. Air conditioning at home is starting to become more popular over the last few years. More homeowners are starting to realise the benefits air conditioning brings and are starting to make more use of them. Among the usual benefits of controlling your homes temperature there are many other benefits which we will discuss. Air conditioning units can help in reducing your energy bills. This is because most modern units make use of high energy pumps which tend to consume around 80% less power than electric heating. If your home currently uses radiant panels or under floor heating you maybe missing out on a vital trick to reduce those energy bills. The air quality of your home can also be significantly improved also. Modern air conditioning units come with air purifying filtration systems which help in reducing bacteria and dust helping those who suffer from allergies. The last point to mention is that of improved home security. If you are indoors and it is hot and humid instead of opening your doors and windows you can simply turn your air conditioning on and away you go. This is especially beneficial during the evening as you do not have to leave your window open all night to keep your room temperature in control. The benefits of having air conditioning at the office or in your home during the summer are endless. So what are you waiting for, order your air conditioning system today.